and Phil Barlow are pictured at the ISPE Filtration Workshop in November. East Sussex based Plastipak hosted the latest ISPE Filtration Workshop, which took place in November. The workshop, presented by Chris Carr FISPE with assistance from Phil Barlow, MISPE and Kim Barlow, MISPE, was an excellent day’s training for those new to the trade, and a useful reminder for more experienced fitters. Chris gave a number of presentations during the day including tips for selecting and sizing the correct plant for the job. 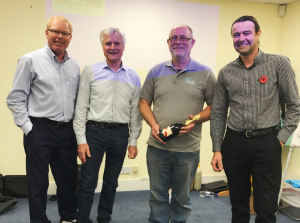 Delegates completed a short multiple-choice exam at the end of the day and the winner was Andy Pattenden of 1066 Pools, who received a bottle of champagne kindly supplied by Golden Coast. A special thanks goes to Plastica, MSI, Waterco, Pollet Pool Group and CPC for supplying items and equipment for the workshop and the goody bags. BACK TO BASICS The Institute will be presenting a free ‘Back to Basics’ Revision Seminar for members, on Tuesday February 21, at Bourne End, near Hemel Hempstead. This is open to all ISPE members and non-members (places must be reserved in advance) but will be specifically aimed to those ISPE Students about to sit their ISPE exams in March 2017. The seminar will feature presentations on all aspects of the Home Study Course and will include tips and advice to help students through the exams. In other news, SPATEX 2017 will see the launch of the ISPE CPD Scheme and full details will be available from the Institute’s stand at SPATEX. Participants will identify their own training needs and goals and record their individual progress on the supplied Activity Log Book and Record Sheet.